Nothing turns heads in our Horsham shop like our Jiggler Lord Berlue collection. 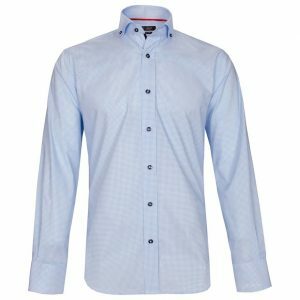 The British brand’s smart casual shirts have built quite a following with our loyal customers thanks to their audacious patterns and unrivalled attention to detail. For #AW17, we’re delighted to unveil a new range of Jiggler smart casual shirts. We hope to have struck a balance between floral and sophisticated styles. Take your pick! Keep your eyes peeled for other styles arriving soon . We’re also offering a 10% discount on all Jiggler Lord Berlue items – just use the offer code JLBAW17 at the checkout. 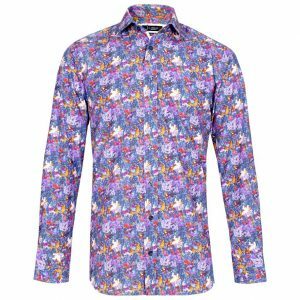 A real Bobby Dazzler of a shirt. 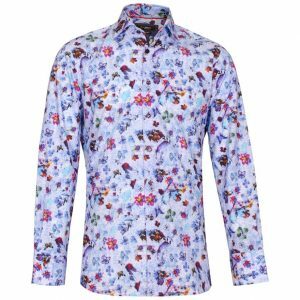 Jiggler specialises in bright floral prints, and this new AW17 design is among their best ever. The stunning all-over pattern blends leaves, herbs and flowers to create an a “lost in nature” look. 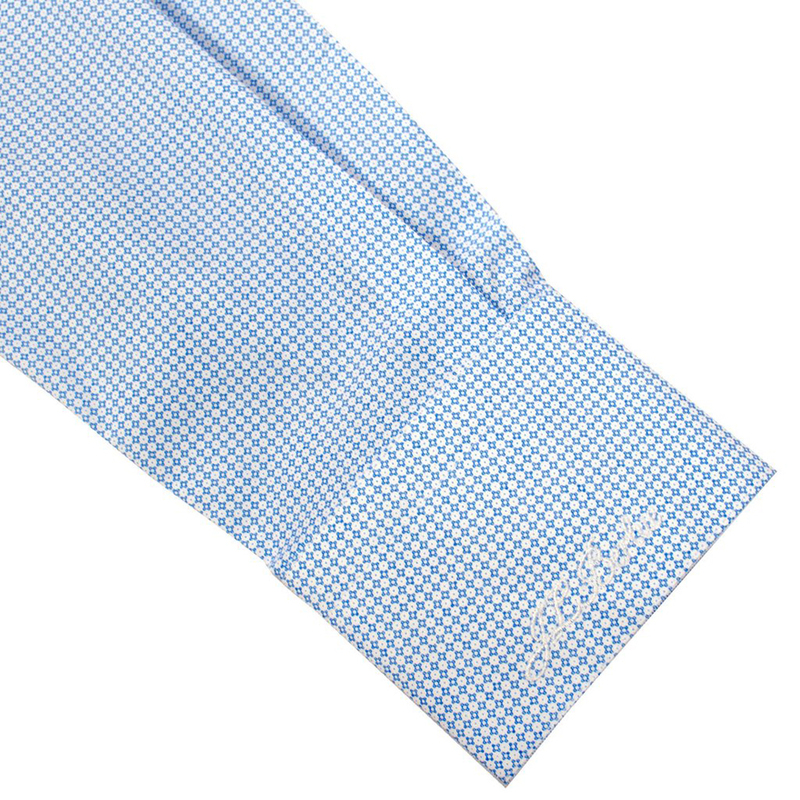 Like many of Jiggler’s smart casual shirts, there’s a contrast trim inside the cuff and collar and inside the placket to add an extra touch of class. The cut-away collar is superbly constructed, as you’d expect from these masters. The fabric is a gloriously soft 100% Super-fine Cotton to ensure maximum comfort. In the same semi-tailored fit as always, due to customer demand. If you’re more into sophisticated prints then Jiggler has some excellent options for you this AW17 season, starting with this cutaway button-down shirt. Look closely at the miniature patterns, as well as the contrast lining under the cuffs, collar, and placket, and you’ll see the attention to detail that has made Jiggler so popular. There’s also the usual JLB extras like branded buttons and self-coloured “J.L. Berlue” stitching on the left cuff. Ideal for the office, a casual event, or even a night out. We’ve had a fabulous response to this shirt in our store. Jiggler jumps back into nature with this inspired floral print shirt. The pattern features butterflies, flowers, and multi-coloured petals. Great with Dark Denim and a Blazer to complete the smart casual look, not forgetting the Tan Brogues. We think it’s stunning! The diamond-shaped micro patterns on this smart casual shirt are the main feature of this simple yet elegant AW17 arrival. The clever use of the geometric design on a black background creates a ” Tonic” effect, a great example of Jiggler’s spirit of innovation. The 100% cotton sateen material is silky-smooth to the touch and a delight to wear. Throw on this shirt for a job interview, a day at the races, or any situation in which you want to make an impression. 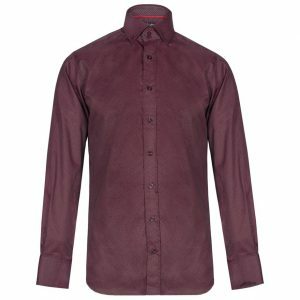 Features a mitred cuff and gorgeous subtle trim in the usual places, plus a cutaway button-down. There will be more deliveries throughout August and September. Don’t forget to use out exclusive offer code JLBAW17 to claim 10% off all Jiggler smart casual shirts!